Hatco Glo-Ray® Dual Infrared Foodwarmers safely keep all hot foods at optimum serving temperatures longer. Foods do not dry out or become discolored; even delicate dishes hold that “just-prepared” look. The Glo-Ray prefocused heat pattern directs heat from a tubular element to bathe the entire holding surface. The continuous aluminum housings, up to 12' (3658 mm) in width, are very strong and eliminate the danger of sagging. The advanced Glo-Ray Dual Mounting feature allows side-by-side mounting of two or more warmers to provide a deeper holding area. A 3" or 6" (76 or 152 mm) spacer is available as well as shatter-resistant incandescent lights that illuminate the warming area. Toggle switches are standard with dual foodwarmers. When selecting infinite controls, they MUST be mounted remotely. 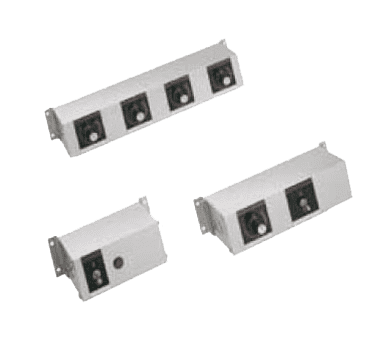 Remote control enclosures are available in several sizes, built in accordance with UL Standards to accommodate switches, indicator lights and wiring, ready for installation. Optional sneeze guard that meet NSF Standards can be ordered for display areas and buffet lines. Made of shatterproof, easyto-clean acrylic, they provide a safe foodserving environment. All models are available in powdercoated Designer colors of Warm Red, Black, Gray Granite, White Granite, Navy Blue, Hunter Green, Antique Copper, or Gloss finishes of Gleaming Gold, Glossy Gray, Bold Black, Radiant Red, Brilliant Blue. The powdercoated surfaces provide durability and are easy to clean. Available in widths from 18" to 12' (457-3658 mm). Variety of models, configurations, colors, and accessories provide unlimited flexibility. Optional coated shatter-resistant incandescent lights enhance brilliant product display while safeguarding food from bulb breakage. Note: Maximum of 12.2 amps. Consult factory if rating of single element at 120 volts exceeds 1400 watts.